Yesterday was a very nice Father's Day, we spent the morning at church and had a nice time visiting with friends, then we were off to our planned outing. 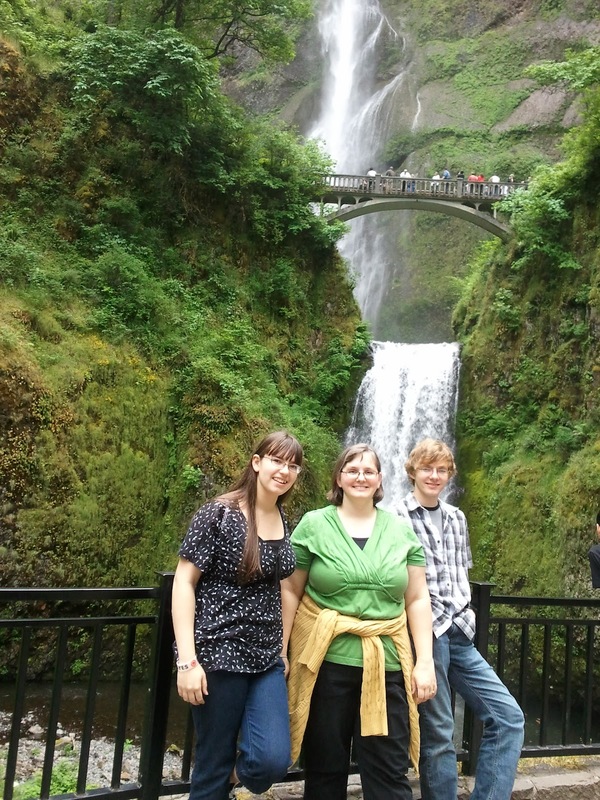 We thought it would be fun to explore Multnomah Falls for Father's Day, and have a nice day exploring. Multnomah Falls is located about 30 minutes outside of Portland, OR, and is considered a "must see" location when visiting this part of Oregon, definitely a beautiful place. You can read a little bit about Multnomah Falls Here. Gary decided to drive part of the way to the falls on the Historic Columbia River Highway, what a beautiful drive, it is no wonder that this highway is considered a national landmark. Our first stop along the way was The Vista House at Crown Point, a beautiful building and viewpoint 733 feet above the Columbia River. The view from the lookout at the top of The Vista House was amazing, nice view of the Columbia River, and all the surrounding trees and cliffs. Here are Joseph and Sarah with Gary, at the lookout. The building itself was also very fun to look around, the domed ceiling and stained glass were very pretty. One last look at The Vista House and we were back on the road. We decided to stop at Shepperd's Dell next. is this beautiful little waterfall. The path walks right up to it, I love how fresh the air is near waterfalls, it was a very beautiful spot. A nice couple offered to take our picture, which I thought was so nice. You can see beautiful rock walls peaking out from the surrounding forest all around this area. Gary had the kids walk out on the bridge the goes over this dell and got some nice pictures of the kids. We saw quite a few more places along the drive that we want to come back and explore another day, I didn't realize there were so many nice places to stop along the way. You could spend quite a few weekends exploring all the different stops along this highway. Our next stop was Multnomah Falls. Even the view from the parking lot is exciting, you can see the lodge with the falls in the background. Here are pictures from the ground level, you can see the two levels of the falls, with the Benson Bridge crossing over the lower portion of the falls. Perfect backdrop for some family pictures. Here is a closer look at the bottom of the falls. Next we made our way up to the bridge. The path to the Benson Bridge is a very easy walk, it is paved the whole way and is under a quarter of a mile. The path is surrounded by very pretty moss covered trees. I loved this old tree stump along the path. We quickly made it to the bridge, and the view was amazing. I am normally quite afraid of heights, I have even gotten nervous getting too near the edge of the second level in the mall, somehow this bridge didn't bother me, probably because the view was so stunningly beautiful. I snapped a picture of Gary on the bridge. Here are some of the views of the falls from the bridge. You can feel the spray of the falls, and it is mesmerizing. and here is a picture of the ground level viewing area to give a little perspective as to how high we were. Of course I needed a picture of Gary and the kids on the bridge. The falls are surrounded by lush mossy rock, very enchanting view. The surrounding green, and the sound and spray of the water, as well as the wonderful fresh air makes this a really peaceful location. Here is a short video clip I took of the falls from the Benson Bridge. After taking in the beauty, we decided to attempt the hike to the top. We started out on the trail, part way up we found a little rock cave. The view through the trees was nice. Along the path we saw quite a few of my most favorite fern- the Maidenhair Fern. We also saw some pretty columbine. The trail to the top of the falls viewing area is only a mile long, however, that mile is a steep mile. I normally have no trouble walking a mile, so I thought it would be a tricky but doable hike. After about four of the switchbacks I was starting to run out of steam, I decided to press on, and made it to switchback number five, I knew that there were eleven switchbacks in total, I made one last effort, but part of the way past the fifth switchback, having to stop to catch my breath, and knowing that the trail was only going to get steeper, decided that I had to call it quits. I do not like quitting, and was very disappointed to not reach the top, but I know my limits, had I made it to the top, I might not have made it back down. I now have a goal, I hope to spend some time doing smaller hikes as well as getting in better shape, and try to tackle it again next time, because I really want to see the top!! Anyway, I felt much better when we made it back down to the bridge, and enjoyed the mist coming off of the falls. We headed back down to ground level, and enjoyed browsing through the gift shop, Sarah bought a deck of cards for her collection, as well as a wooden yo-yo with a picture of the falls, and Joseph bought a small black totem poll for his room, I found some cute Bigfoot pencils, Gary, like many men I'm sure, is not really into trinkets, so after that we headed to the snack bar for a treat. and this little chipmunk. They were hanging around the garbage can and sneaking bits of leftovers. Both were very cute! By the eating area you can see the stream leading away from the falls. After eating, we took one last look at the falls. The headed back to the parking lot. The late afternoon sun was looking so pretty on this cliff. The sky was also beautiful. The weather all day was slightly overcast, and the perfect temperature for exploring. We spotted this train track bridge on the way back to the car, and had to check it out. I thought the sign on it was neat, with all of the different distances to various cities. The path past the train bridge, led to this stream, and you could see some nice fish in it, it is a protected area for trout and juvenile salmon. A few more last looks at the fall, and then we headed home. Our day was wonderful, and we were all glad to be celebrating Father's Day, Gary is a wonderful dad, and I feel very blessed to have him as a husband and the father of our children. We made our way home, and had a nice dinner, we were originally planing on BBQ for dinner, but it was a little late, so instead, I oven baked a big batch of BBQ beef ribs (I normally make pork ribs, so it was fun experimenting with beef ribs, and they were yummy), we also had steamed veggies and potatoes. We enjoyed a movie, and were all tired and ready for bed after our fun day. I am looking forward to this week as the official start to summer, and look forward to many more summer outings. Such amazing scenery and so lush! Great photo of the bridge, and how nice of the couple to take the photo of your family ~ and it is a great pic! Thanks for sharing at Happy Family Times!! You'll make it to the top yet, April! Such a beautiful area. Whenever I look at picture of nature like that, I like to think of what the pioneers were thinking when they first came to all this wilderness. It must have felt overwhelming and awesome at the same time. What a fun trip! I love it in the gorge. It's so beautiful at the falls. :) Looks like fun, April! Kelly~ Thanks :) All the green was so beautiful, It was great to get a family photo, we thought it was so nice of them. I am enjoying checking out the Happy Family Time posts, thanks for hosting! That looks like such a lovely day out and so nice to see older children enjoying a family day out too. Some amazing photos there I bet it was quite breathtaking!